Philadelphia Flyers goaltender Carter Hart is a quick learner, which has helped give him maturity beyond his years. If you want to know what it feels like to be Carter Hart when he's off his game, blink. Blink a lot. Because that's what he does as he tries to regain his focus, his cool, the tools that have allowed him such success at such a young age, allowed him to so far handle the pressure of playing in big arenas among big men with big pressure attached to every game, to every save. Shauna Hart saw this when the Minnesota Wild came to town earlier this month. With a stable of big and aggressive forwards, the Wild muscled their way around her son's crease for much of the first period, bumping him, obstructing him, knocking in the first two goals amid the mayhem. As interim coach Scott Gordon called a timeout to keep his new team from heading off the rails, as the Flyers had done for so much of this season, Hart paced around the ice near the bench, blinking as if a genie trying to wish the first 8 1/2 minutes of the game away. The Wild scored two more goals on Hart over the game’s final 51 minutes. The last came only after Flyers defenseman Robert Hagg had pushed Eric Staal toward Hart and Staal used that opportunity to bulldoze the 6-foot-2, 180-pound goaltender one additional time. The Flyers scored seven goals over the same time period. When it ended in a 7-4 victory, Hart had stopped 34 of 38 Minnesota shots, including 13 of 14 in the final period. It is the single most encouraging aspect of his game, that “compete” he talks about, and harkens to the game’s greats. Brodeur. Roy. Parent. They all could keep their teams in it on their worst nights. Three days after Minnesota jumped Hart and the Flyers with two early goals, the Bruins did the same thing — and the same thing happened. The Flyers scored the next four goals, then held off intense late pressure by another playoff-aspiring team. This time, Hart made 39 saves. This time, he didn’t blink once. “He doesn't play young,” Radko Gudas said. Carter Hart taking a drink before the start of the second period against Columbus in December. Not yet anyway. 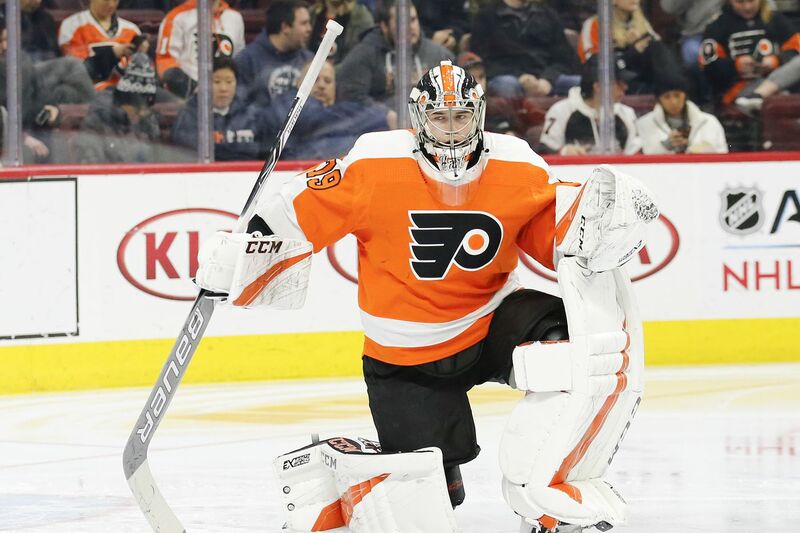 The fear, the reason Hart was sent to the Flyers' AHL affiliate at the start of the season, the reason they shipped him there for a few games this weekend, is his youth. Being a pro for the first time in his life, living on his own on the other side of the continent from where he played as a junior or where he grew up — well, this isn’t Russia, is it? Ah, but for Hart, it is, kind of. From the moment he served a five-game suspension as a 10-year-old for protecting his crease with his stick, this so-called kid has been focused, been an outlier. Any pause in his progress, like when he brooded as a backup in his first season in juniors, has been both brief and educational. That’s to his credit. Simply put, he’s a quick learner, which has allowed this maturity beyond his years. He’ll gladly recount his mileposts for you. A broken stick in frustration meant he paid for a new one. A conversation with his junior coach, Kevin Constantine, halfway through that first year as a 16-year-old triggered a rededication to his craft. "He said, ‘You have to show me you want to play. Show you care,’ " Hart said of that conversation with Constantine, who had already coached the Sharks, Penguins and Devils. " 'If you show that to me, we will play you more. But you have to compete harder and show that you care. “I really took that to heart the second half of the year, and I took over the job the second half of that year. Little surprise then that Hart is an offseason drinker only. And then, he said, only on weekends when he’s golfing “with the boys.” Little surprise, too, that he has decided to stay in his Voorhees hotel room for the time being rather than accept Jake Voracek’s generous offer to use his Philly apartment for free. Yeah, he said all that. But maybe, just maybe, the Flyers have finally found that goalie they’ve been seeking for decades.